There are many Prophecies in your bible, better yet in The Book of Yahweh, that show the Temple will be rebuilt in this generation, in troublous times. The building called the temple was once referred to as The House of Yahweh, built by Solomon. Archaeological digs have uncovered mounds of evidence proving the Name Yahweh, The House of Yahweh, and the location of that House. King David wrote, I will dwell in The House of Yahweh forever. When the Pharisees, Sadducees, Essenes, and Herodians decided to move to Rome to escape those like Yahchanan, who continually told them that they were breaking Yahweh’s Laws, they took The Book of Yahweh with them. They hoped to stop the daily reading of the Laws and the constant reminders from the people that they were sinning, not following Yahweh’s Laws of Righteousness. They took The Book of Yahweh to Rome and hid it for over 1500 years, refusing to allow anyone to translate it or print it. They even refused to allow it to be read or the written Word to be practiced. In fact, Pope Constantine passed laws that carried the death penalty for anyone keeping the Fourth Commandment. It was also against Constantine’s laws to keep the Feast Days or to own a Menorah–Seven Lamp Lampstand–shown to represent the prophesied Works of Yahweh; the Last Work being established in this generation. The Temple was destroyed in 70 CE after the Pharisees, Sadducees, Essenes, and Herodians made their move to Rome. They ordered their army and Titus, their Roman general, to destroy the temple and destroy all the people who had come to Jerusalem to attend the Feast. The Pharisees, Sadducees, Essenes, and Herodians ordered all of the wealth of The House of Yahweh and that of Jerusalem to be delivered to Rome. The arch of Titus depicts this historic move. Jerusalem has never had peace and this generation is crying out for help. So destroying the temple and Jerusalem did not put an end to the wars, but there are Prophecies that show the Peaceful Solution to many problems. Rebuilding the temple is one of those Peaceful Solution Prophecies. There is a Prophecy written by Yahweh’s Prophet Yechetzqyah (whose name was changed to Ezekiel to make the people forget the Name of Yahweh) showing great turmoil among the people in Jerusalem for this generation. The Book of Revelation shows the same. Yechetzqyah also shows a Peaceful Solution to rebuilding the Temple, taking a step towards peace on the Temple Mount itself. The House of Yahweh spent several years researching these Prophecies and our engineers spent years precisely building a perfect replica of the temple Yahweh’s Prophet Yechetzqyah was inspired to write about for this prophesied generation. This temple model is now housed at The House of Yahweh near Abilene, TX. Anyone who would like to view it can do so by requesting an appointment through The House of Yahweh. I urge you to carefully read this Prophecy that Yechetzqyah was inspired to write, clearly showing the separation wall but the outer court would be left out. The time for rebuilding the temple is now. I pray Yahweh blesses your understanding. 1 We were glad when they said to us: Let us go into The House of Yahweh! 2 Our feet will stand within your gates, O Yerusalem. 4 Where the tribes go up, the tribes of Yah­weh, as a testimony commanded for Israyl, to give thanks to the Name of Yahweh! 5 For thrones are set there for Judgment, the thrones of the house of David. 6 Pray for the peace of Yerusalem! May they have peace who love you! 7 Peace be within your walls, and blessings be within your palaces! 8 For the sake of our brothers and our friends, we will now say; peace be within you! 9 For the sake of The House of Yahweh our Father, we pray for your peace! This Psalm was inspired by Yahweh for all of us who love Yerusalem and who love the land that Yahweh first chose as a place to set His Name. In the 6th verse of this Psalm, we are instructed by the Creator Himself, Yahweh, to pray that peace be instituted in Yerusalem. Yes, it is a fact that we do not have peace in Yerusalem now. But, it is possible for this generation to bring peace to Yerusalem and to all the Land of Beauty, through the clear, simple plan which is revealed in the Prophecies written for us in the Scriptures; yes, this generation. In my many years of study, of which you will only see a part in this article, we have discovered that the Prophet Yechetzqyah wrote about a temple and a time period, for the day in which we now live! Even though Yechetzqyah was inspired to write this Prophecy over 600 years before the Temple was destroyed in 70 c.e., he was inspired to write for us who live in these days; these troublous days, these same troublous times that the other Inspired Prophets also proclaimed. In these same Prophecies we are also shown a Peaceful Solution for rebuilding the Temple; the Temple of Yahweh! But, what is even more important, these same Prophecies show us how we, in this generation, can bring peace to Yerusalem and to the world. In Yechetzqyah’s Prophecies are the complete measurements of a Temple—a Temple unlike any other that has ever been built before. Many of these measurements have never made sense to any other scholars, but with Yahweh’s Inspiration we have come to see exactly what the Prophet Yechetzqyah saw…the pattern for building the Temple in these Last Days! This pattern, with all its measurements, exactly fits the area of land sitting north of the Dome of the Rock! Yechetzqyah confirms that this is where the Temple will be set. Yes, this pattern could only have been used in this generation and this pattern offers to us: this generation, a Peaceful Solution to rebuilding the Temple, and an end to the troublous times which Yerusalem now faces; perilous times which carry the grave possibility of involving the whole world. At this time, I, and any of the engineers who have been working on these measurements, are willing and able to show this pattern to any group interested in rebuilding the Temple and bringing peace to yerusalem. All we now ask is that you study this brochure. Then, contact me to set up an appointment. Many of the Prophets of Old actually spoke of our day, describing existing problems facing all the nations on this planet. Whether we want to believe it or not, the Prophets of Old were inspired by the Creator, Yahweh! Since we will be mostly dealing with the Prophet Yechetzqyah’s (Ezekiyl’s) Prophecies in this article, let us put this Prophet to the test, so to speak, to see if there is any reliability in the things that he was inspired to write. And yes, there is significant evidence available to prove whether or not his proclamations can be relied upon: whether they were written by men or were inspired by a Super Intelligence. In the year 590 b.c.e., the Prophet Yechetzqyah spoke to and prophesied against a great city called Tyre. Tyre was nationally comparable at that time to New York City, U.S.A., today. With sea ports and island harbors, Tyre readily imported a steady stream of supplies through her sea routes. Tyre was also supplied by land, but if she were to be cut off from supplies by land, she supposedly could easily survive because of her sea lanes. The walls surrounding this city were thought to be of eternal strength. They were built to protect this thriving city against any and all attacks. This city was impregnable, or so it was believed. Tyre was a Phoenician seaport in what is now Lebanon. Originally, an island with two great harbors, the chief trading center of the Mediterranean, it is now a peninsula. Tyre was founded in the 1500’s b.c.e. Tyre resisted siege by Assyrian and Babylonian alike; defied several armies, including that of Nebuchadnezzar; fell (332 b.c.e.) to Alexander the Great after being besieged for seven months. After she fell, 8,000 Tyrians were slaughtered, 2,000 executed, and 3,000 sold into slavery. The Romans, as well as Cleopatra, cherished Tyre’s silken garments. The Prophet Yechetzqyah was inspired by the Creator, Whose Name is Yahweh, to prophesy against this city, as great as it was, and to say, in the year 590 b.c.e., ‘‘You will fall!’’ The Holy Scriptures in which this Prophecy is written give complete details of Tyre’s destruction. Prophecy Not By Mere Men! 3 And say to Tyre; O you who are situated at the entry of the sea, a merchant of the people for many isles, this is what Father Yahweh says: O Tyre, you have said; I am of perfect beauty. 4 Your borders are in the midst of the seas, your builders have perfected your beauty. 5 They made all your ship’s boards of fir trees from Senir; they have taken cedars from Leb­anon to make masts for you. 6 Of the oaks of Bashan they have made your oars; the company of the Ashurites have made your benches of ivory, brought from the isles of Chittim; Cyprus. 7 Fine linen with embroidered work from Egypt was what you spread for your sail; blue and purple from the isles of Elishah was what covered you. 8 The inhabitants of Sidon and Arvad were your mariners; oarsmen; your wise men, O Tyre, that were in you, were your pilots. 9 Elders of Gebal and its wise men were in you to caulk your seams; all the ships of the sea and their oarsmen were in you to deal in your merchandise. 10 Those from Persia, from Lud, and from Phut were in your army, your men of war hung shield and helmet in you; they brought forth your splendor. 11 The men of Arvad, with your army, were upon your walls all around; and the Gam­madim were in your towers. They hung their shields upon your walls all around; they have made your beauty perfect. 12 Tarshish; Spain, was your merchant, do­ing business with you because of your multitude of all kinds of riches; with silver, iron, tin, and lead they traded for your wares. 13 Yavan; Greece, Tubal, and Meshech; in the mountainous region between the Black and Caspian Seas, were your merchants; they traded slaves and articles of bronze in your market. 14 Those of the house of Togarmah; Armenia, traded for your wares with chariot horses, ca­valry horses, and mules. 15 The men of Dedan; in Arabia, were your merchants. Many isles were your own markets; they brought you in payment horns of ivory and ebony. 16 Aram; Syria, was your merchant because of the multitude of the wares you made; they traded for your wares with their merchandise: emeralds, purple, embroidered work, fine lin­en, coral, and agate. 17 Yahdah and the land of Israyl, they were your merchants; they traded in your market wheat of Minnith; in Ammon, pannag; product uncertain, honey, oil, and balm. 3 This is what Father Yahweh says: Behold, this is what will come to pass against you and your institutions, O Satan! Many nations will be caused to come up against you and your institutions, just as the sea causes its waves to come up. 4 And they will destroy the walls of Tyre, and break down the citadel of your power O Satan and break down her towers; her dust will be scraped from her, and she will be made like the top of a rock. 5 It will be a place for the spreading of nets in the midst of the sea, for I have spoken, says Father Yahweh: it will become a plunder for the nations. 6 And Satan’s daughters; her cities and villages, which are on the mainland, will be slain by the sword; and they will know that I am Yahweh. 7 For this is what Father Yahweh says: Be­hold, Nebuchadnezzar king of Bab­ylon, a king of kings, will be brought against Tyre, the citadel of your institutions, from the north, with horses, with chariots, with horse­men, with an army and many people. 8 He will slay your daughters on the main­land with the sword; he will build up a siege ramp against your citadels, build a wall against your citadels, and raise up the buckler; shields as a defense, against your citadels. 9 He will direct the blows of his battering rams against the walls of your citadels, and with his axes he will break down your towers. 10 By reason of the abundance of his horses, their dust will cover your institutions; the walls of your citadels will shake at the noise of the horsemen, of the wheels, and of the chariots, when he enters into your gates, as men enter a city in which a breach has been made. 11 With the hooves of his horses he will tread down all your streets; he will slay your people by the sword, and your mighty obelisks of god (el) worship will fall to the ground. 12 They will make plunder of your riches, and make a prey of your merchandise; they will break down the walls of your citadels, and destroy your plea­sant houses; then they will lay your circles of Stones Measured off for Desolations, your sacred Poles, and the rubble from your altars into the midst of the sea. 13 The voice of your songs will be put to an end; the sound of your harps will be heard no more. 14 You and your citadels will be made like the top of a rock; you will be a place to spread nets upon. You will be rebuilt no more; for I, Yahweh, have spoken, says Father Yahweh. 15 This is what Father Yahweh says to Tyre: Will the isles not shake at the sound of your fall, when the wounded cry, when the slaughter is made in the midst of you? 16 Then all the princes of the sea will come down from their thrones, lay aside their robes, and remove their embroidered garments. They will clothe themselves with trembling; they will sit upon the ground, tremble every moment, and be astonished; appalled, at you. 17 They will take up a lamentation over you, and say of you; How you are destroyed, O one of renown, attended by men of the sea! She was powerful in the sea, she and her inhabitants, who cause their terror to be on all who dwelled in it! 18 Now will the isles tremble in the day of your fall; yes, the isles that are in the sea will be troubled at your departure. 20 Then you will be brought down with those who descend into the pit, with the people of ancient times, and who were set below__in places desolate from antiquity, with those who go down into the pit__so that you will never be attended again; and I will set glory in the land of the living. 21 You will be made a terror, and you will be no more, though you are searched for, yet you will never be found again, says Father Yahweh. 18 Damascus was your merchant in the mul­titude of the products you made, because of your great wealth of riches; trading with you with the wine of Helbon and with white wool. 19 Dan also, and Yavan; Greece, traded with yarn from Uzal; in Arabia for your wares: wrought iron, cassia, and calamus were traded in your market. 20 Dedan was your merchant in saddlecloths for riding. 21 Arabia and all the princes of Kedar, they traded with you in lambs, rams, and goats; in these they were your merchants. 22 The merchants of Sheba and Raamah; in Arabia, were your merchants. They traded for your wares with the choicest spices, with all pre­cious stones, and gold. 23 Haran, Canneh, and Eden; in Mesopota­mia, the merchants of Sheba; on the Euphrates, Asshur, and Chilmad; near Baghdad, were your merchants. 24 These were your merchants in choice fab­rics, in blue clothes, in embroidered garments, in cedarchests of multicolored apparel, in strong twined cords; in these they traded with you. 25 The ships of Tarshish served as carriers for your merchandise. You were replenished, and made very glorious in the midst of the seas. 26 Your rowers have brought you into great waters, but the east wind has broken you in the midst of the seas. 27 Your riches, your wares, your merchan­dise, your oarsmen, your pilots, your caulkers, the traders of your merchandise, and all your men of war who are in you, with all your com­pany which is in your midst, will fall into the heart of the seas in the day of your ruin. These Prophecies came to pass in detail, but not until 258 years had passed! Yes, Yechetzqyah had prophesied against Tyre in 590 b.c.e., but this Prophecy did not come to pass until the year 332 b.c.e.—258 years after he wrote this Prophecy against this great city. I repeat, no mere man can foretell future events. Many ‘‘guess’’ at them, but are always proven wrong as time goes by. However, Yechetzqyah, being inspired by the Super Power who exists in heaven, was able to do what no mere man, working alone, can do. This same Creator Who inspired the Prophet Yechetzqyah to write of Tyre’s destruction, also inspired a set of laws to be written; laws which would assure peace for all nations. The leaders of the nations would do well to take heed to these Laws and apply them to the governments in existence today. 5 See, I have taught you Statutes and Judg­ments, just as Yahweh my Father commanded me, so that you may follow them in the land you are entering to take possession of. 6 Therefore, be careful to observe and do them; for this is your wisdom and your under­standing in the sight of the nations who will hear of all these Statutes, and say: Surely this great nation is a wise and understanding people. 7 What other nation is so great as to have their gods (elohim) with them, the way yahweh our father is near us whenever we pray to him? 8 And what other nation is so great as to have such Righteous Statutes and Judgments as are in all this body of law which I set in front of you this day? 9 Only take heed to yourself, and diligently keep yourself from forgetting the things your eyes have seen, nor let them depart from your heart all the days of your life. And teach them to your children and to your children’s children. 10 Remember the day you stood in front of Yahweh your Father at Horeb, when Yahweh said to me: Gather the people to Me, and I will let them hear my laws, so they may learn to reverence me all the days they live on the earth, and so they may teach their children. 11 As soon as the king heard the words of The Book of the Law, he tore his clothes. 13 Go, inquire of yahweh for me, for the people, and for all Yahdah, about the words of this book that has been found. Great is Yah­weh’s anger that burns against us, because our fathers have not obeyed the words of this book to do according to all that is written concern­ing us. 5 The earth also is defiled under the inhabi­tants of it, because they have transgressed the Laws, changed the Ordinance, and broken the Everlasting Covenant. 6 Because of this, the curse has devoured the earth, and they who dwell therein are desolate; therefore, the inhabitants of the earth are burn­ed, and few men left. 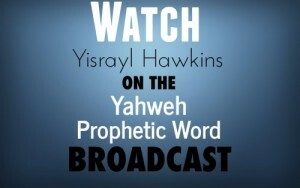 Mind you, the Prophet Isayah (Yeshayah) is not speaking specifically and exclusively to laymen, although each individual is responsible for his conduct before Yahweh, Isayah was inspired by Yahweh to speak to the priests who turned from Yahweh’s Way, who are preventing the people from the pursuit of Righteousness and instruction in Holiness! It was these so-called priests who ‘‘changed the Ordinances’’. They are also responsible for not bringing yahweh’s people back to his every Word! I have heard it said by many of my Israyli friends that officials, holding influential offices, who could put into motion the building of the temple of yahweh, will not do so, because if the Temple were built, it would become a necessity that the whole law be kept, and they resist the thought of keeping the Laws of Yahweh! 17 As for you–get yourself ready! stand up, and speak to them all that i command you. Do not break down because of them, or I will break you down in front of them. 18 For behold, this day I have made you a fortified city, an iron pillar, and walls of bronze against the whole land–against the kings of Yahdah, against its princes, against its priests, and against the people of the land; am haeretz, landed gentry. 19 They will fight against you, but they will not prevail against you, for i am with you to deliver you, says Yahweh. The world’s religious and political leaders today are still in opposition to what the Righteous Prophet Yeremyah stood up for, just as the leaders were in the day that Yeremyah wrote these words. It doesn’t take a brilliant person to look around us today and see that all nations are suffering from the results of breaking the laws that our Creator gave to secure peace and joy for all. In every nation, including and especially the USA and Israyl, these laws are being broken, and millions of people are suffering the consequences. Not only war is a result of this lawbreaking, of which there are approximately 60 wars raging in this world as of this writing, but also crime, sickness, and disease. At this moment, all nations have a disease epidemic on their hands which seems, by all information gathered at this time, to be incurable!—100% deadly, spreading more rapidly than first anticipated. This disease is called aids. From the doctors’ reports I have read, this scourge is being spread very rapidly by millions of people worldwide, who do not even know they are infected! If the people had been keeping the laws of yahweh, this disease would never have had the opportunity to spread. If these people would begin to keep the laws of yahweh today, this disease would never spread to another person. There is yet another disease that is being spread in the same way as aids, which is just as deadly as aids! This disease is hepatitis b—a viral disease whose complications include chronic liver disease and primary liver cancer. this disease is not receiving the publicity that aids does, because it does not kill as quickly. It takes two, three, or sometimes four decades to kill after the initial Hepatitis B Viral (hbv) infection. Nevertheless, this is spreading; it is also taking thousands of lives each year, all because the laws of yahweh–which, if kept, would safeguard anyone from contracting this disease–have been totally rejected! Even without the nuclear bombs that will surely take their toll, all the sexually spread viruses, which are rampant in the world at this time, would soon bring the end of civilization. As hard as it is to believe, an increasing number of israyli women–who are hbv carriers–give birth each year! Many of their infants will become hbv carriers themselves. The number of hbv carriers is even higher in other nations. Isn’t it time we wake up to the fact that we need to start publishing the laws of yahweh to all nations? Isn’t it time to proclaim these Laws of prevention, in order to stem the flow of death and suffering that the breaking of these laws cause? Isn’t it time to bring these laws forth, making them the first line of defense against these diseases, rather than allowing lawbreakers to teach ignorant people to ‘‘use condoms”? Isn’t it time that we teach these Laws of Yahweh diligently to our children, worldwide? Isn’t their blood upon our hands for allowing these deadly diseases and destructive weapons to proliferate, when we can stop it? The Christians have taken their pagan traditions to all the world, while the people of the Book have sat back, keeping the Laws of Yahweh bound up among ourselves—the very laws that would prevent all this suffering and dying! We are content to dwell in the safety of our own homes, not being willing to rock the boat which is headed directly into a storm of destruction. We have allowed devastation to close in around us, until there is no safety left—not in the synagogue, not in Israyl, not in the world. Unless we are willing to turn to yahweh soon, in a few short years it will simply be too late to reverse this situation. All nations’ leaders have always talked peace, while they have prepared for war. But, the time has come that such destructive weapons have been developed due to modern technology, that the war waged with them has the capability of completely destroying mankind—especially in the tiny nation of Israyl. I fear the day when the Prophecies which the Prophet Yahyl spoke against Israyl will come to pass. These Prophecies will come to pass! They are as certain to come to pass as all the other Prophecies of Yahweh which have already taken place. We tend to think that we are safe in the particular nation in which we live, until we learn the shocking fact that even our so-called enemies, in what we may like to think of as small nations, have the technology and expertise to manufacture 20 megaton and larger warheads. With guided missiles to carry these nuclear weapons, these small nations could destroy Israyl tomorrow, or even the usa. If a 20 megaton nuclear missile was dropped on the Hebrew University in Yerusalem, in less than one-millionth of a second classroom temperatures would rise to 150 million degrees Farenheit—more than four times the temperature of the center of the sun. The college would be vaporized, leaving a crater 600 feet deep and nearly a mile and a half in diameter. To a distance of five miles from the college, nothing would be left. Those who saw the flash of light would be vaporized, houses would explode into raging flames, concrete surfaces would disintegrate, and glass would melt. Within 18 seconds, the shock wave, traveling at 300 m.p.h., would suffocate those who had managed to find shelter below ground level. Ten seconds later, the wind reverse would generate a firestorm which would devastate an area of about one million acres. Seven to eight miles away, glass fragments would hurtle through the air at 135 m.p.h., all the trees would be burned and then be uprooted by the shock wave, bridges would collapse, cars would be smashed, and wooden buildings would burn. Within half an hour those still surviving below ground level would be suffocated by the firestorm. At a distance of 16 miles, lawns and leaves would ignite, paint would evaporate, people would be blinded and their skin charred, and cars would collide as their tires and upholstery burst into flames. The shock wave would tear the roofs from houses and blow the walls in. At a distance of 20 miles from the center of the blast, exposed skin would suffer third-degree burns, and combustible material would burst into flames. When the mushroom cloud had stabilized, covering about 40 miles in all directions, radioactive particles would begin to settle to earth, raising the radiation level to an excess of 4,000 to 5,000 rads/hour, and delivering a lethal dose within seven to eight minutes. These calculations are not mine; they are from the Veterans for Peace, Inc. These calculations coincide with calculations from other branches of the U.S. government. Please note, however, that these calculations are only based upon a 20 megaton nuclear blast—which is a very small blast, compared to the arsenal of nuclear weapons owned by the United States and Republic of Russia. 2 A day of darkness and of gloominess, a day of clouds and of thick darkness, like the morn­ing clouds spread upon the mountains. A great people, and a strong; there has not ever been the like, nor will there be any more after it, to the years of many generations. 3 A fire devours in front of them, and behind them a flame burns. The land is like the garden of Eden in front of them, but behind them a desolate wilderness; yes, and nothing will es­cape them. There is no use in deceiving ourselves, we are at the point where the Prophets said we would be in this generation. The longer we refuse to seek the help of our Creator the worse our situation will become. 5 Now therefore this is what Yahweh our Father says: Consider your ways! 6 You have sown much, but bring in little; you eat, but do not have enough; you drink, but you are not filled with drink; you clothe your­selves, but there is none warm; and he who earns wages, earns wages just to put into a bag with holes. 7 This is what Yahweh our Father says: Con­sider your ways! 8 Go up to the mountains, and bring timber, and build the house, so that I may take plea­sure in it and be glorified, says Yahweh. 9 You looked for much, but, lo, it came to lit­tle; and when you brought it home, I blew upon it. Why? says Yahweh of hosts: Because of My House which lies waste, while each man is busy with his own house. There is an absolutely amazing Prophecy; a Prophecy which Yechetzqyah was inspired by Yahweh to write. In it, he gives the measurements of the third Temple! These measurements have never been used before, in the manner in which Yechetzqyah gave them. The first Temple was built under Solomon; the second Temple was rebuilt under Zerubbabel; which was later refurbished by Herod. But what makes this Prophecy amazing is the fact that this Prophecy reveals that Yechetzqyah saw the Temple Mount in our day, with a building which sits upon it at the present time. Not only this, Yechetzqyah’s Prophecies show us a definite way to peace, with a Peaceful Solution to the problems now existing between the Yahdaim (Jews) and the Arabs. Please notice carefully as this Great Prophecy unfolds in the following pages. As you read, please keep in mind that Yechetzqyah’s Prophecies were inspired by Yahweh. Therefore, Yechetzqyah’s Prophecy written on the following pages will be just as sure to come to pass as the Prophecy which Yechetzqyah wrote about the city of Tyre. Yes, when studying Yechetzqyah’s Prophecies, it becomes very clear that they were inspired by a Superior Being! No man could make Prophecies such as those in Yechetzqyah Chapter 26, concerning a powerful city to be doomed to destruction, and then bring it to pass over 250 years later, in detail! • these measurements were given to us to be used to build the Temple now! In the past few years, I, along with three engineers, have traveled to Israyl in order to study the design of this Temple; the design that Yechetzqyah gives in this magnificent Prophecy. Many scholars have thought that Yechetzqyah made a mistake as he wrote down some of the measurements; that he was just “going by memory”, trying to remember the measurements of Solomon’s Temple, and therefore memory failing him, he wrote the measurements wrong. This is not the case at all! First, we can see from the magnificent Prophecy that Yechetzqyah wrote, that it is just that: a Prophecy to take place at a later date. More than that: it is a Prophecy for our day! Yes! Yechetzqyah shows us the Temple Mount as it appears at this day—not his day; that is, when he was alive. Yechetzqyah 40:1-5 shows that Yechetzqyah was brought to the Temple Mount in our day, in our generation. The measurements that Yechetzqyah wrote have never been used before, but are to be used now, by this generation. 1 In the twenty-fifth year of our captivity, in the beginning of the year, in the tenth day of the moon, in the fourteenth year after the city had fallen; in the selfsame day the hand of Yahweh was upon me, and He took me there. 2 In the visions of yahweh, He brought me into the land of Israyl, and set me upon the greatly exalted mountain; and on it, like a building of a city on the south. 3 When he took me there, then behold, a being; man-like, whose appearance resembled bronze. With a line of flax and a measuring reed in his hand, he stood in the clearing, or opening. 4 Then the being said to me: Son of man, look with your eyes and hear with your ears, and fix your mind upon everything that I show you; for the purpose that I show this to you, were you brought here. Declare all that you see to the house of israyl. 5 And behold, there was an adjoining sep­aration; dividing structure, around a temple. In the being’s hand was a measuring reed six long cubits; about 10 1/2 feet—each cubit; about 1 1/2 feet, with a handbreadth; about 3 inches. So he measured the separation’s width to the struc­ture, one reed; about 10 1/2 feet, and the height; rise, one reed. Yechetzqyah is now coming, as it were, to the whole House of Israyl, as Yahweh ordered him to do—not in 585 b.c.e. when he wrote this Prophecy, but the time in which this was intended—for now! It is possible for this generation to actually bring in the Kingdom of Yahweh, and bring to a stop the senseless bloodshed, oppression, and starvation which is rampant in this world. Even sickness and disease can be wiped off the face of the earth by this generation, as the Prophets of Old clearly show. 6 In His days Yahdah will be saved, and Israyl will dwell safely; and this is the Name that He will proclaim to them__Yahweh Tsidqenu: yahweh our Righteousness. 8 But they will say; As surely as yahweh lives who brought up and led the seed of the house of israyl out of the protected place, and from all countries where I had driven them; and they will dwell in their own land. 9 My heart is broken within me because of the prophets; all my bones shake. I am like a drunken man; like a man whom wine has over­come, because of Yahweh, and because of His Holy Words; the Law and the Prophets. The Great Prophet Yeremyah was speaking to us, in this generation; speaking of the things which yahweh is making possible for us to do. The nation of Israyl has not dwelt safely since the days of Solomon; neither has ‘‘Yahdah been saved’’, because, as the Prophet Yeremyah has shown, our land is now full of the worship of gods. It is full of turning our backs on Yahweh! This Prophecy is for our generation, and our generation can change this and fulfill these Prophecies for our days. Yechetzqyah was among the captives being physically held in Babylon, just as Yechetzqyah 1:1 says, but in the visions of Yahweh he was brought to Israyl and set on the Temple Mount, as it is seen today. In the visions of yahweh, He brought me into the land of Israyl, and set me upon the greatly exalted mountain; and on it, like a building of a city on the south. This was not a city that Yechetzqyah saw, this was one single building, a city building—a public building. Yechetzqyah was set on the Temple Mount, and sitting on the Temple Mount was a building, south of the Temple. This is all he could see, and that is exactly what he did see. Yechetzqyah was not speaking about the city of Yerusalem; there would be no need to tell them about seeing ‘‘part of the city’’ to the south. No! This was one single building, which was, in fact, strange to Yechetzqyah, and rightly so, because he had not seen this building before, not ever. No public building had ever stood there before, but in Yechetzqyah’s vision a public building was sitting there, south of the temple. 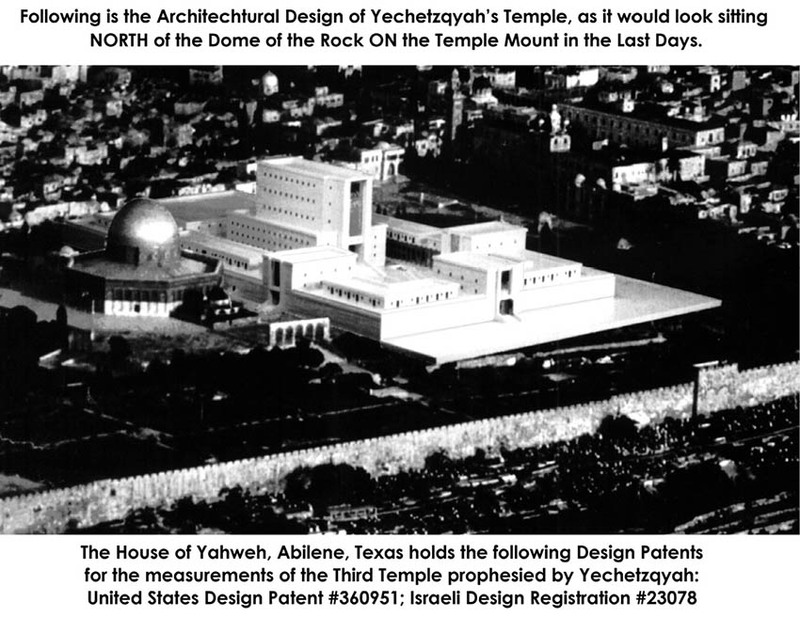 This building that Yechetzqyah saw was none other than the Dome of the Rock, which is sitting there at this time. This building is to remain in its same location, with a dividing wall separating it from the rebuilt temple. In Yechetzqyah’s Prophecy, the outer court is not rebuilt when the Temple is rebuilt. Yes, the rebuilt Temple sits right beside the Dome of the Rock, with only a dividing wall separating the Dome of the Rock from the inner court. These measurements, given by Yechetzqyah, show that this dividing wall separating this building from the inner court serves no military purpose; it only serves as a privacy fence. Never before in the history of the Temple has the Temple been built without its outer court, but never before has there been a Moslem building sitting on the Temple Mount. Yahweh shows us that we do not need to harm the Arabs; we do not need to fight over the Temple Mount. Yahweh shows us that we can, and that we should, build this Temple on the vacant land where the Temple stood before, and that we should build a dividing wall to separate the Arab worshipers from the Jewish worshipers. This can be the salvation of Israyl and Yahdah! We are facing a time when only a Super Power can save us, and Prophecy shows us that this Super Power will save us—if we act now, by obeying His Laws and fulfilling these simple Prophecies. The troubles, which are centered around the Middle East currently, involve all nations. Any day now, these troubles could flare up beyond containment, risking national security everywhere. we are not merely facing the possibility of war from the nations which surround us but are facing the reality that all the world’s major powers will be involved as well. It is also every living being on the earth facing the mighty nuclear arsenal, stockpiled by nearly every nation on this planet. National leaders are fools to rely upon the ‘‘strength’’ of their armies any longer. 6 By Mercy and Truth iniquity is purged; by reverence for yahweh, men depart from evil. 7 When a man’s ways please yahweh, He makes even his enemies be at peace with him. Behold, upon the mountains the feet of him who brings glad tidings, who publishes peace! O Yahdah, keep your appointed Feasts; perform your vows. Then the wicked will no long­er invade you; he will be utterly cut off. 12 Yes, they made their hearts like a hard adamant stone, in order not to hear the laws and the Words, which Yahweh our Father had sent by His Spirit through the former prophets. Therefore, great wrath came from Yahweh of hosts. 13 Just as I called, and they would not hear, so they called, and i would not hear, says Yah­weh our Father! 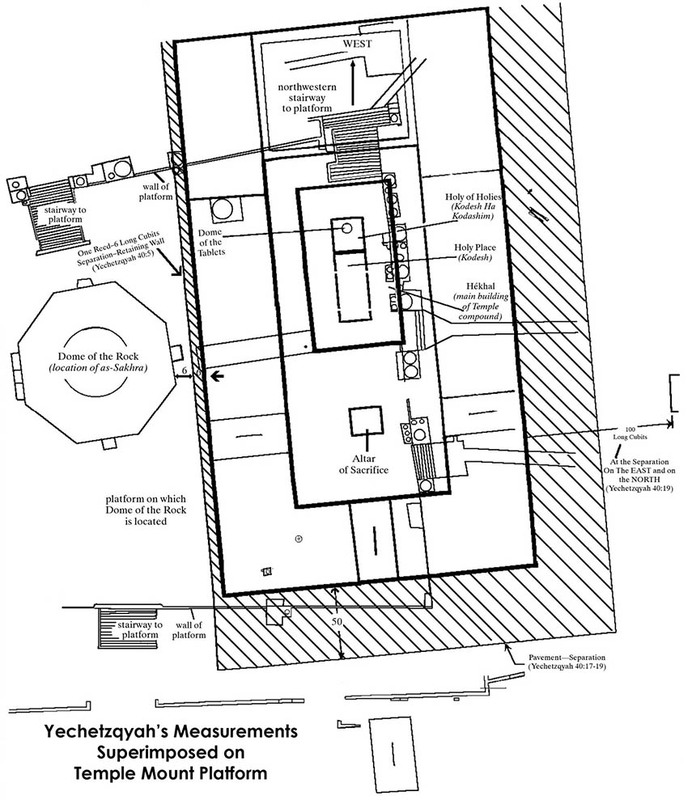 I said earlier that the measurements given by Yechetzqyah have never been used in any Temple previously. I do not believe we should insult an Inspired Prophet of Yahweh, many of whose Prophecies have been fulfilled in detail, by saying that “Yechetzqyah made a mistake”. We should realize these measurements were not used before, because they were written for our generation. Then, we should use them now, in our generation. I visited Israyl several times to work on these measurements. Working with me on this project are experts in the fields of engineering and construction, who also visited Israyl for this same purpose. We spent hundreds of hours working to lay out the exact pattern of the next Temple according to the exact measurements of the Temple prophesied by Yechetzqyah. Yahweh, himself, gave us these measurements; yes, Yahweh inspired His House to see what He, Himself, had inspired to be written; who then saw yahweh’s measurements, and put them on paper for all the world to see. I now want you to see that these measurements exactly fit the area of vacant ground lying north of the Dome of the Rock on the temple mount. In the March/April 1983 issue of the Biblical Archeology Review, Volume IX, NO. 2, Dr. Asher S. Kaufman, in his article on pages 40-58: Where the Ancient Temple of Jerusalem Stood; Extant ‘Foundation Stone’ for the Ark of the Covenant Is Identified, has proven that the First and Second Temples sat exactly in line with the Golden Gate: the east gate. 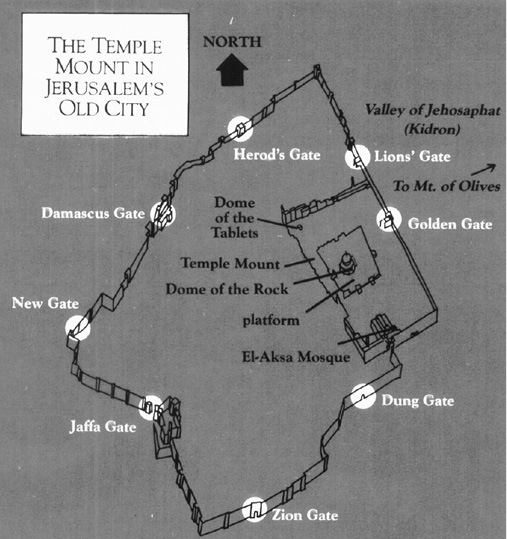 In the above diagram of the ‘‘First and Second Temples superimposed on the Temple Mount Platform,’’ found on page 57 of this article, showing a straight line running from the Golden Gate on the east, directly to the “Dome of the Tablets”, which now sits northwest of the Dome of the Rock. The Dome of the Tablets, as Dr. Kaufman has also proven, is the foundation stone upon which the Ark of the Covenant rested inside the Holy of Holies. Yes, as Dr. Kaufman has proven in this article, the original Temple site is approximately 330 feet (100 meters) northwest of the Dome of the Rock. The Dome of the Rock was not built on the site of the Temple! The Dome of the Rock was built south of it. The next thing one must understand is the fact that Yahweh has established a pattern of how to build. This same pattern has always been followed, whether the Tent of Meeting set up by Mosheh; the First Temple built under Solomon; the Second Temple built by Zerubbabel; or Herod’s refurbishing of the Second Temple. And the Scriptural dimensions have been given to us in these Last Days, through the Prophet Yechetzqyah, for the rebuilding of Yahweh’s Temple according to this same pattern. And these are the measurements of the altar in the long cubits; about 1 3/4 feet__the long cubit being a cubit; about 1 1/2 feet, with a hand­breadth; about 3 inches, And the gutter was a cubit deep, and a cubit wide, with a border of one span; a rim about 9 inches wide next to the edge of it all around; and this was the top of the altar. In Dr. Kaufman’s article, he established the length of the cubit used in the construction of the Second Temple as that of the median cubit; which was divided into six handbreadths, a measure totaling 43.7 centimeters, a length of approximately 17.480 inches. Therefore, the pattern used in building Yechetzqyah’s Temple would be the same pattern which was established in the beginning by Yahweh for His House—only the length of each cubit would be extended by one handbreadth; thereby, making this Temple a larger structure. The hands of Zerubbabel have laid the foundation of this House; his hands will also finish it. And you will know that Yahweh of hosts has sent me to you. Yes, the elevations and the land contouring have already been prepared by Yahweh. All that remains is minimal excavation of the existing courts to reach the foundation, which has already been laid. The foundation is under the existing platform of the Temple Mount, waiting for the construction to begin. • The Vestibule, Holy Place, and Most Holy Place are recorded. The Altar is measured, the building on the west is measured, with the Priests’ Kitchens established, the Priests’ Rooms and Singers’ Chambers are designated, etc. • The entrances and exits of the people are written. • All that remains is to begin! Son of man, show the house to the house of Israyl, so that they may be ashamed of their iniquities; and let them measure the pattern. 8508. toknîyth, tok-neeth´; from 8506; admeasurement, i.e. consummation:—pattern, sum. 2. a model or plan used as a guide in making things; set of forms to the shape of which material is cut for assembly into the finished article. Therefore, Yechetzqyah’s Temple will have specific dimensions in fulfillment of the plan which Yahweh has given through Prophecy. Above is the diagram of Yechetzqyah’s pattern; his plan which Yahweh gave to him, superimposed on the Temple Mount platform. As you can see, Yechetzqyah’s Temple is a larger structure than the First and Second Temples, due to the fact that Yechetzqyah’s cubit is a larger cubit. As you can also see, Yechetzqyah’s Temple measurements fit this area perfectly! Then, we come to the most conclusive evidence presented in the Scriptures that Yechetzqyah was standing on the Temple Mount in our day. This evidence is the fact that the outer court of the original Temple is not rebuilt in its entirety at the time Yechetzqyah’s Temple is rebuilt. Before we begin going through the Scriptures themselves, I must inform you that Yechetzqyah was being led through this Temple complex by a being, who measured with the reed of six long cubits, and who admonished Yechetzqyah to write what he saw as they walked along. 5 …So he measured the separation’s width to the struc­ture, (to the Dome of the Rock) one reed; about 10 1/2 feet, and the height; rise, one reed. Yes, on the south of the Temple Mount, where they were standing, was the Dome of the Rock and the separation’s width to this structure was one reed. After they measured this separation to this structure, Yechetzqyah and the being walked to the East Gate: the Golden Gate, and began its detailed measurements, as you may read in Yechetzqyah 40:6-16. 17 Then he brought me towards an outer court area. And behold, rooms; dwellings, and a pavement being constructed by the court all around; thirty rooms facing the pavement. 18 Now the pavement next to the inner gates, was the same as the length to the gates of the lower pavement. 19 Then he measured the width from the fore­front of the lower gate to the outer front of the inner court, at the separation, a hundred cubits to the east; and to the north, a hundred cubits. I want to draw your attention to Yechetzqyah 40:19, to the fact that there are pavements measuring 100 cubits: about 175 feet, in this outer court which only extend to the east and to the north. In other words: There is no pavement extending 100 cubits to the south, because that is where Yechetzqyah saw the Dome of the Rock standing. The diagram showing Yechetzqyah’s Measurements Superimposed on Temple Mount Platform shows this separation-pavement extending to the east and to the north (Yechetzqyah 40:19), with the separation-retaining wall one reed from the structure (Dome of the Rock) on the south (Yechetzqyah 40:2,5). 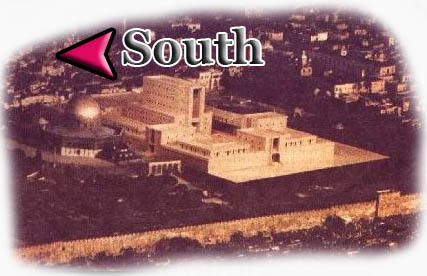 Digressing here, and to corroborate the fact that the Dome of the Rock sits on the south of the Temple Mount, Dr. Kaufman points out in his article that the Mishnah (Middot 2:1) states that the greater part of the outer court (Har Ha-Bayit) in the original Temple was on the south. However, in Yechetzqyah’s Temple, this area on the south only extends one reed—about 10½ feet! Do you realize what this means? This means that the Dome of the Rock was built on what is known as the south outer court area. • Yes, there are pavements extending only on the east side and the north side. • There is no pavement on the west side, because the Building (with the Priests’ Kitchens) will take up this area, just as Yechetzqyah 41:12 states. 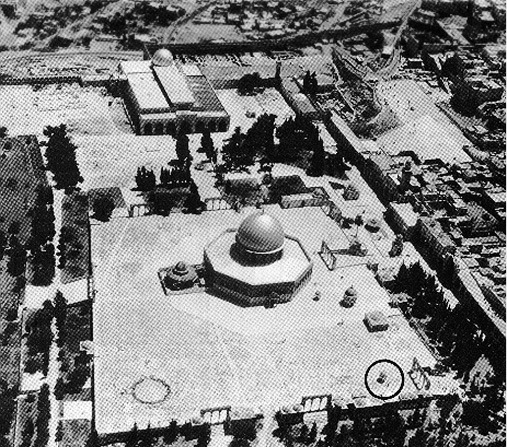 • There is no pavement on the south side because that is where the Dome of the Rock sits. All of these measurements have been checked by us, over and over. And we do have these exact measurements of Yechetzqyah’s Temple: the Excavations, the Gates, the Courts, The House of Yahweh with the Vestibule, the Holy Place, and the Most Holy Place—all according to this Prophecy inspired by Yahweh, and according to its exact Scriptural dimensions. Yahweh has given us these measurements. We, The House of Yahweh, have these measurements. They are ready and at your disposal. Let us begin this momentous task to rebuild the Temple of Yahweh for these Last Days! 7 And I will shake all nations, and the most desired things of all the heathen will come; and i will fill this house with glory, says Yah­weh our Father. 8 The silver is Mine, and the gold is Mine, says Yah­weh our Father. 9 The glory of this latter House will be greater than the glory of the former, says Yah­weh our Father; and in this place I will give peace, says Yah­weh our Father. This generation can be the one to bring peace to this planet. You, as a leader, can be the historical figure who does the Will of yahweh in bringing back the Holy Temple. This could be the biggest peace project ever ventured in the history of mankind, simply because of the magnitude of the war which all nations now face. Yes, the most likely outcome of the nuclear war which lies ahead is that there will be few survivors. I urge you, as a leader, to do your part in promoting the rebuilding of this next Temple—the Temple Yahweh inspired through Yechetzqyah, in the peaceful manner which Yahweh has revealed to us—to bring peace to Israyl and to the world.